I came across this photo recently and it really made me smile. 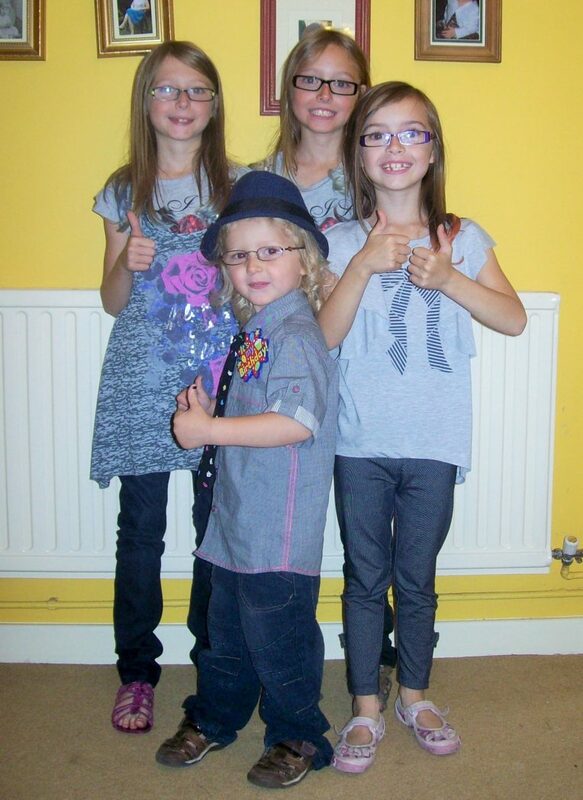 It was taken on LV’s 4th birthday ( in 2010) he still likes to dress just as funky now. I also had a bit of a giggle because we have a running joke in the family that our girls have never been able to wear skinny jeans or leggings without them being baggy! It’s my birthday, show me some love! So yesterday was my birthday and I have hit the grand old age of 32 🙂 I had a typical motherly birthday of everyone sleeping late so the usual pre-school rush was a little more manic than usual, hubby in work from lunchtime till 10.30pm, kids in school and after school clubs, baby all bunged up, teething and really not in a happy mood and no cake. But I’m not complaining, I got to spend the day sat on my bum, snuggling and comfort nursing, watching episodes of Bones and munching on the choccies the kids bought me. What more could I want? My mother also stopped in on her way to work with a batch of freshly baked scones, Welsh butter, posh jam and cream. They were very yummy and were scoffed before the day was out. Not just by me I might add! I didn’t really have any presents to open other than a diary (I had picked out for myself) and the choccies but I do have some really cool presents. Can you guess what my actual presents are? They are very bloggy ones….? I bet you didn’t guess right so I’ll tell you. I’m going to Blogfest 2014 AND BritMums Live 2015!!!! For those non-bloggers amongst you, these events are both blogging conferences. They are great way to meet up with other bloggers, learn lot’s of new things and connect with some brands. I am beyond excited that I can go to them both!!! I must admit I am also a little scared, but mostly really, really excited. Did I say that already? But even after those fab gifts you know what would really make my birthday extra special? Put the icing on the virtual cake (being as I didn’t get a real one!) so to speak? To get a bit more love from you wonderful people! I know you visit here and I love that you do! But did you know I also have a Facebook page? You can keep track of all the comings and goings here on the blog, plus extras. All you need to do is leave a like! As my not so little baby is turning one next week, I have been posting lots of cute photo’s right from when he was teeny on Instagram, so I thought I’d follow suit here. 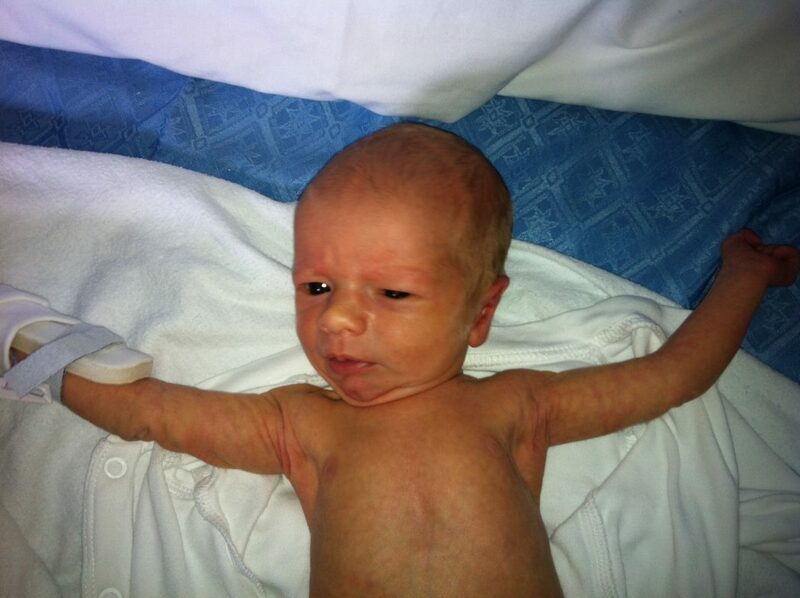 This is one from when he was 3 days old. I hadn’t long had him back from special care. You can see all the loose skin around his arms and chin. Also, the mouldings on his head were really prominent for weeks, you can just see them here. Saturday was my mother’s birthday. She has been really unwell with a nasty kidney infection and only just got out of hospital on Thursday after spending Mother’s day there. I knew just the thing that would cheer her up, homemade cards! 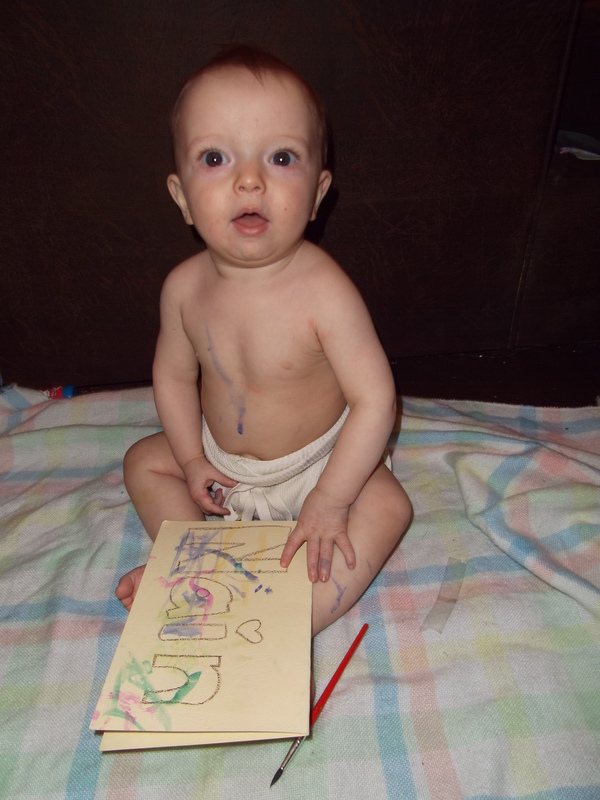 Now this isn’t his first attempt at becoming an artist, we have done finger painting and handprints before now. But the kids had already been using the watercolours to paint theirs so figured we would give it a try and not worry about dragging more stuff out of the cupboard. 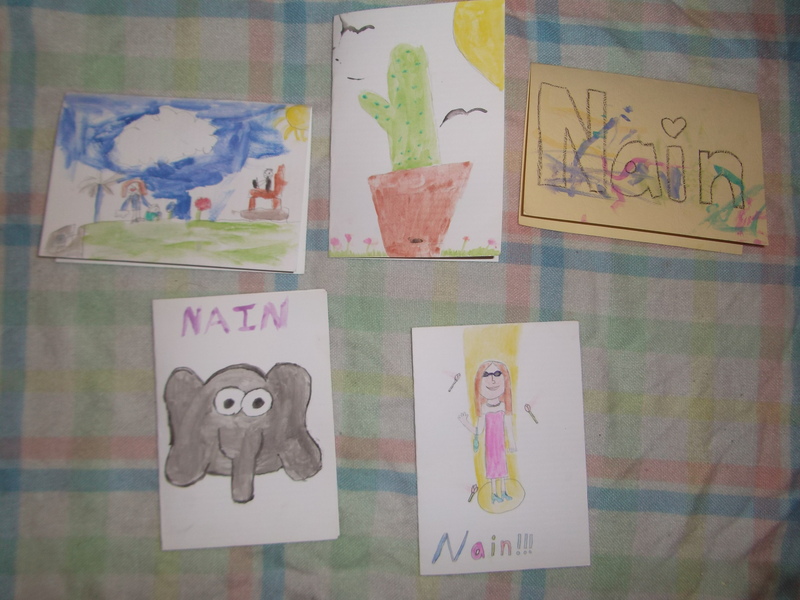 Just so there was a little something extra on the card I wrote Nain on it, which is Welsh for Grandmother. At first I tried to paint his hand but he was more interested in grabbing the brush so I let him use it himself and just loaded it up with paint. 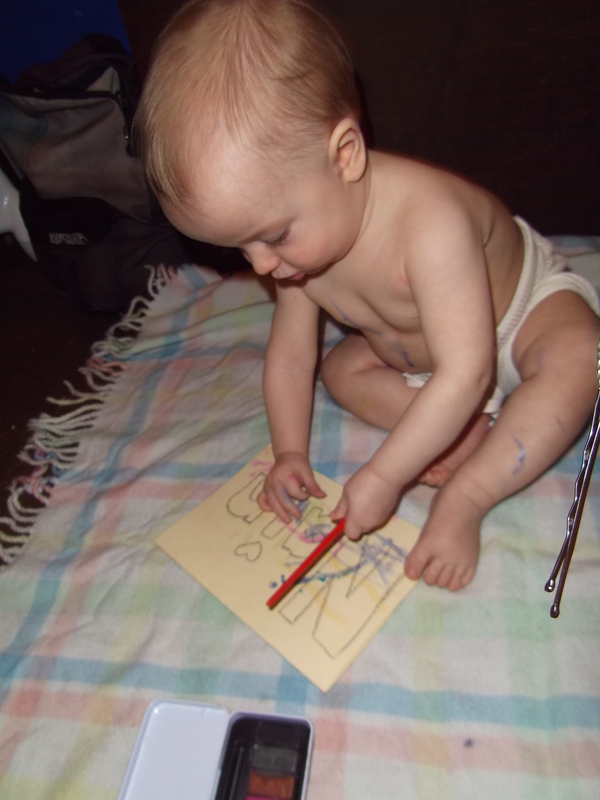 Each time I loaded the brush I put it down on the card so he would make some marks while he tried to pick it up and give him some idea of what it does. Of course he also wanted to make himself a little more colourful! Needless to say my mother loved them all and they really did cheer her up. We even got to visit for a while which she hasn’t had the energy for, for a few weeks which was nice. 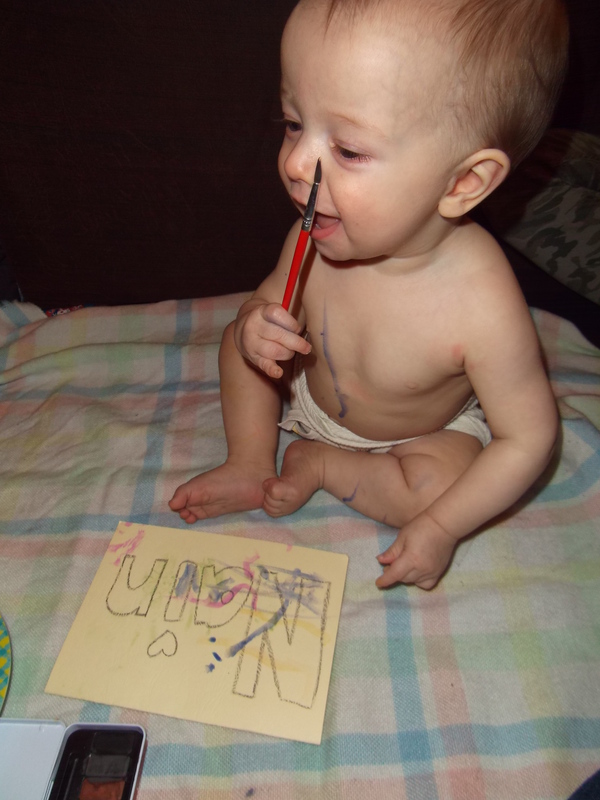 Do your kids like making birthday cards for family?